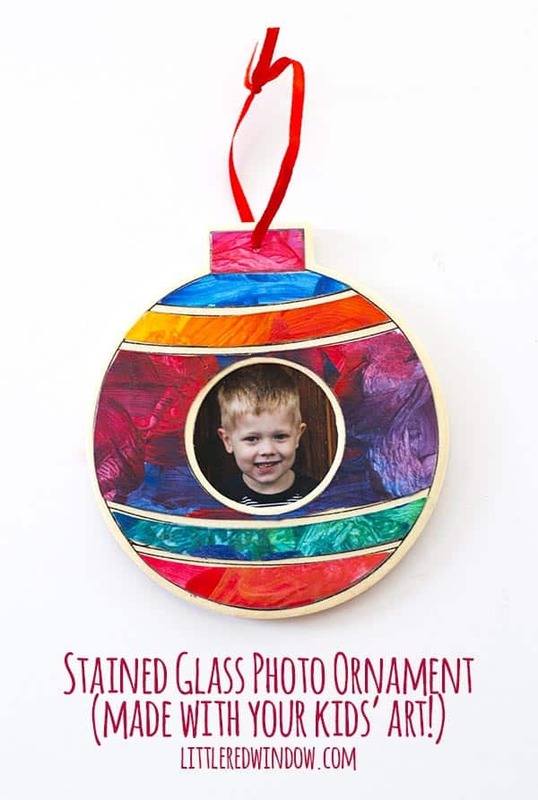 This Stained Glass Christmas Photo Ornament is a fun project to do with your kids, use their artwork to make this beautiful stained glass effect! You guys! 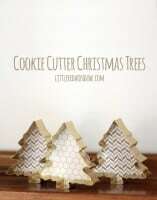 I totally forgot this cute project even existed until we unpacked our ornaments to decorate the tree this year! And THEN I remember I had photographed and documented it to share with you. But of course I didn’t want to post about it until after they were gifted and I didn’t think you all would be super interested in reading about Christmas ornaments last January. So anyway, I always have O help me make some kind of diy ornament gift to give to family members. I think it’s important that he understands what it’s like to put some effort into doing something nice for the people you love. And to feel pride when they open something you made. 1. The first thing I did was to lay one of the ornaments down on my scanner and scan it as is. Then I cleaned it up in photoshop until I had a basic line drawing that matched the ornament shape. 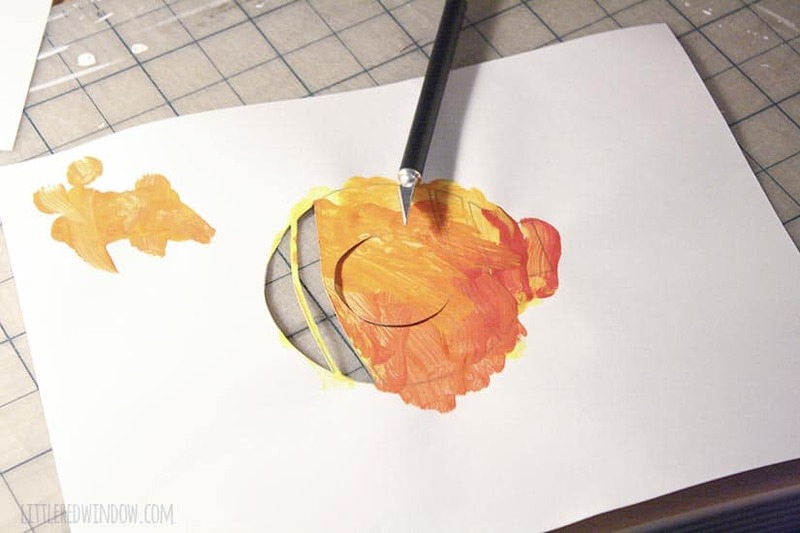 If you don’t have a scanner and/or photoshop, then I would suggest you use tracing paper to trace the shapes on the ornament and then cut those out and use them as stencils. 2. 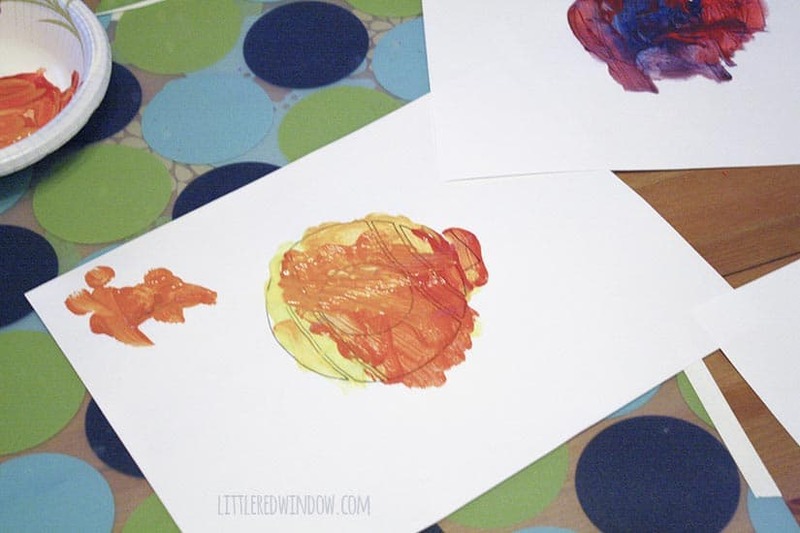 I printed out 5 copies of my ornament shapes and got O painting. To keep them from being a brown muddy mess, I only gave him two colors per ornament (for example a dark blue and a green, or orange and yellow). 3. 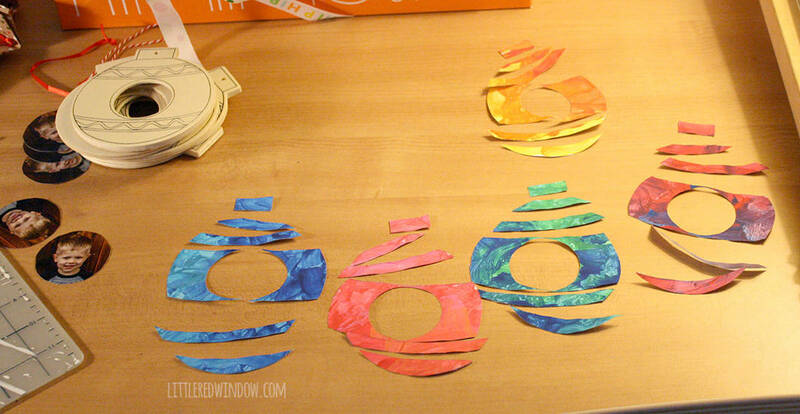 When the paint was dry, I carefully cut out all of the internal ornament shapes. 4. Here they are all arranged in the way they were painted. 5. 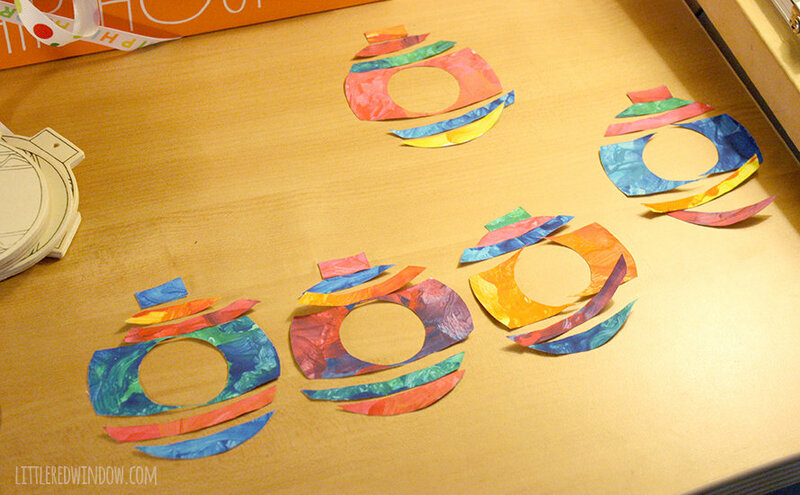 Then to make 5 pretty ornaments that looked like stained glass (and were each slightly different), I mixed up the colors. 6. 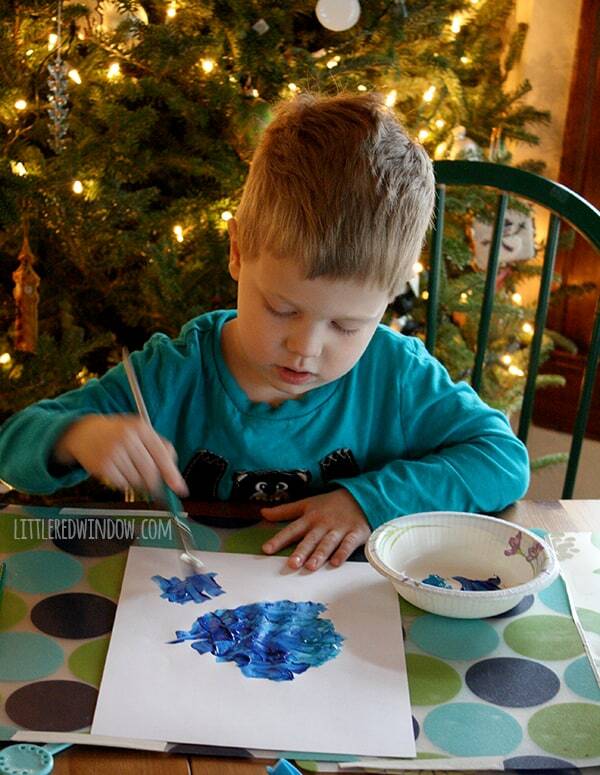 Finally I used mod podge to attach the painted paper to the ornaments and then again on top to protect the paint. I popped a cute picture of O in the middle, had him write his name on the back and that’s it! 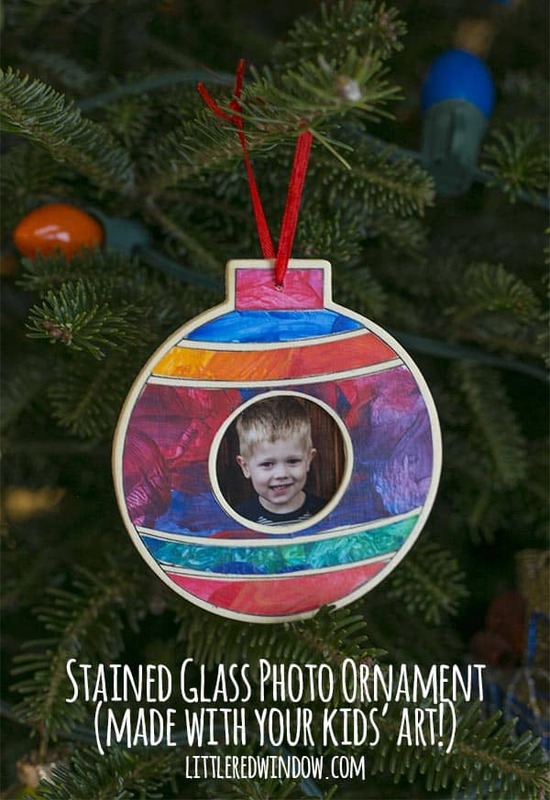 A cute keepsake ornament that your little one can be proud of!